Aviation authorities in the United States (US) and Europe have ordered an inspection on almost 700 Boeing 737 engines after a fan blade failure killed a woman en route from New York to Dallas. "Fan blade failure due to cracking... could result in an engine in-flight shutdown, uncontained release of debris, and possible airplane decompression," the US Federal Aviation Administration (FAA) said in a statement. Initial investigations on the plane that was forced to perform an emergency landing found, that a fan blade had broken off and penetrated the engine casing. 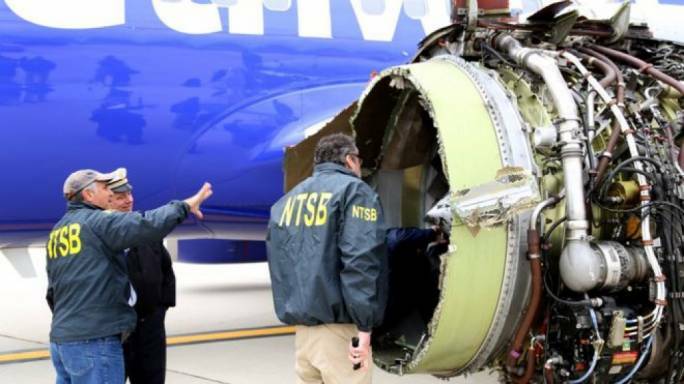 NTSB chairman Robert Sumwalt said that the casing which is meant to protect the engine from such debris, was penetrated due to the high speed of the broken blade.